You know the old saying: Baseball is America’s pastime. It turns out, that might not actually be true. 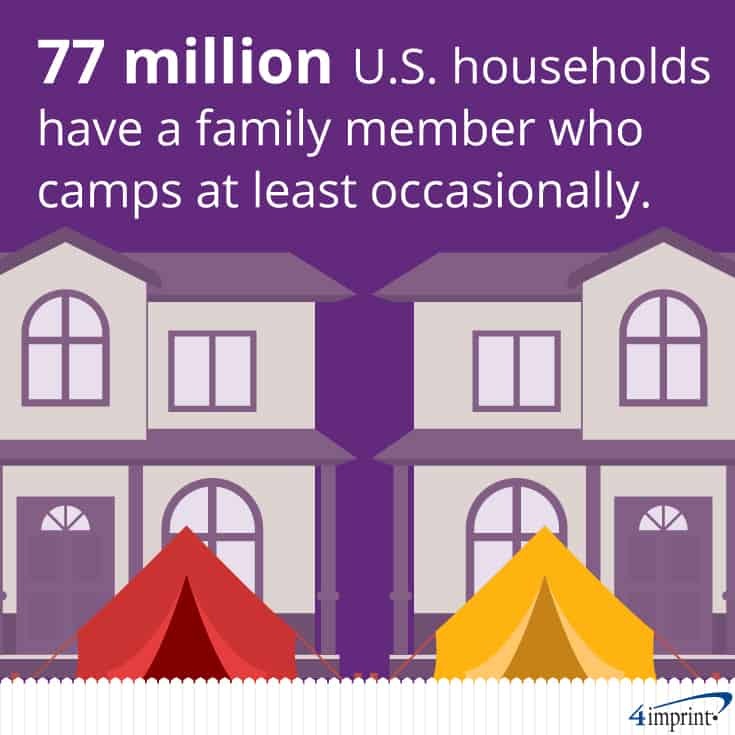 Almost 70 million people attended a baseball game in 2018, while 77 million U.S. households have a family member who camps at least occasionally. So maybe camping is the new national pastime! If you have a client who can’t wait to head to the woods for the weekend or is planning a week-long hiking trip, camping promotional items will have them thinking about your brand with every campfire, s’more and breath of fresh air. Camping requires at least some gear. In fact, 47 percent of adult campers spent between $51 and $200 on camping gear in 2016. 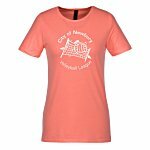 Keep this in mind when choosing your outdoor promotional items, and you’ll be a hit with everyone from outdoor enthusiasts to those whose idea of outdoor adventures is a nap in a backyard hammock. 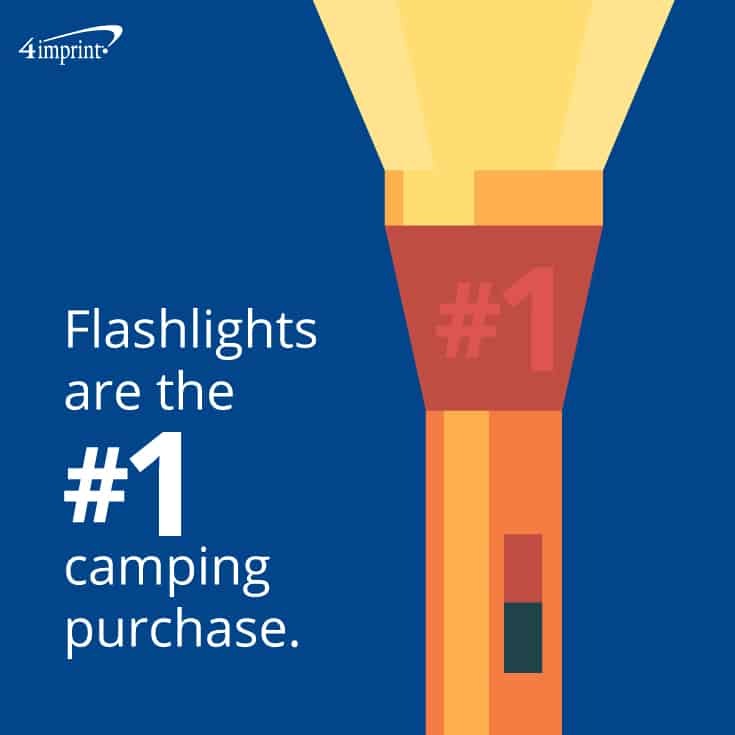 Flashlights are the number one camping purchase, with just under 50 percent of campers buying one in the last year. A Rocket Clip Flashlight covers just about any situation. It has a clip to attach to a backpack or belt loop, plus it converts to a lantern. It’s perfect for late-night hikes or just to have on hand in case of a power outage at home. Anytime they’re heading on an adventure, there’s a risk of injury. Help them handle minor bumps and bruises with the Safe Care First Aid Kit. It’s great to carry on a hike or even just to have at a soccer game. The Cool Gear Filtration Bottle works equally well for someone who wants to stay hydrated during the workday or for someone who wants to filter water at the campground. And the Outdoor Multifunction Tool Kit is a handy tool. It’s ideal to keep in a camper, but it’s also great to have on hand to open a bottle at a company barbecue. People on camping trips typically take part in a variety of physical activities, including hiking, canoeing and climbing. Having healthy snacks on hand can keep your campers fueled and ready for action. A Resealable Kraft Snack Pouch – Trail Mix or Survival Snack Tube will help them keep their energy up and appetite satisfied. And there’s nothing more rewarding after a day of fun than a sweet treat. The S’mores Kit – Marshmallows comes with everything needed to make the delicious camping favorite. Nature often provides great views, but it doesn’t always offer a comfortable place to relax and enjoy the sights. The High Sierra® Camping Chair folds up, making it a camping promotional item that is easy to transport from home to camp to a favorite fishing spot. For something easy to carry, the Picnic/Stadium Blanket is a great option, thanks to its roll-up design. Plus it has a water-resistant backing to keep campers dry. The Camping Table & Chairs to Go has a collapsible table and chairs—all which fold up to fit in an included zippered case. 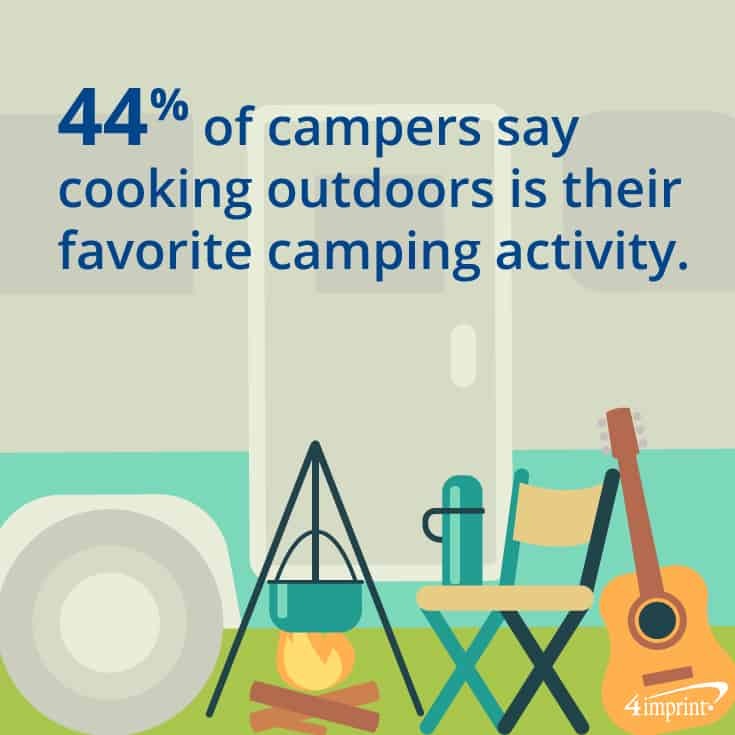 There’s nothing quite like making a meal outdoors—in fact, 44 percent of campers rate it as a favorite camping activity. 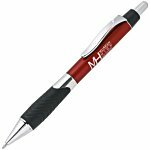 These higher-end outdoor promotional items are ideal for a top customer or employee who loves to cook outside. 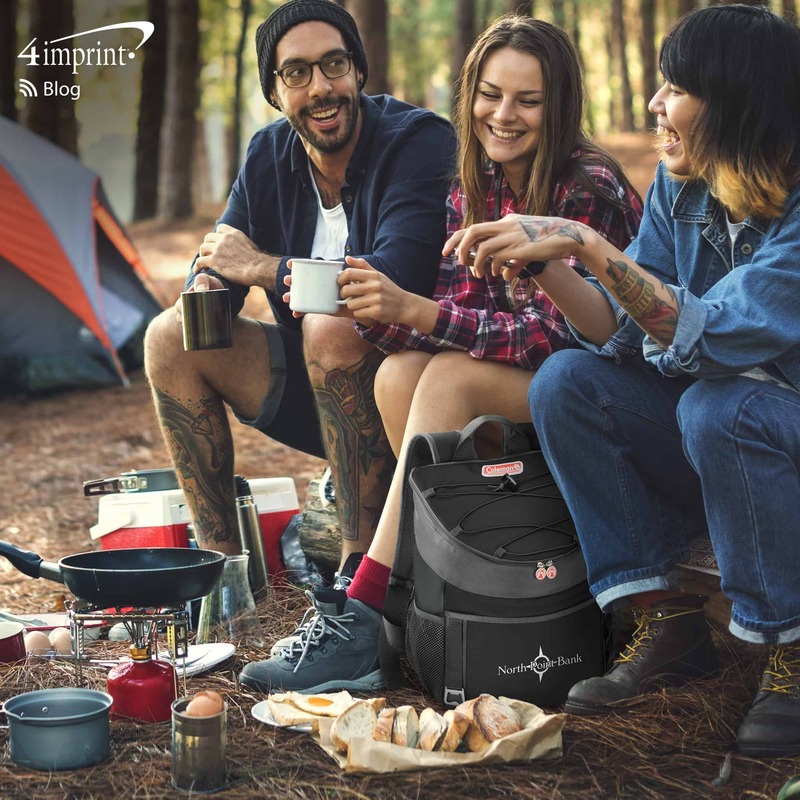 The Coleman® Roadtrip Instastart Propane Party Grill comes with its own carrying case for easy hauling and it can be started without matches. It pairs well with the 18-Piece BBQ Set in Case. It comes with every utensil needed to baste, turn or carve. Store dry goods, utensils and more in the spacious Coleman 28-Can Backpack Cooler. Plus it has an insulated area to keep food and beverages cool. 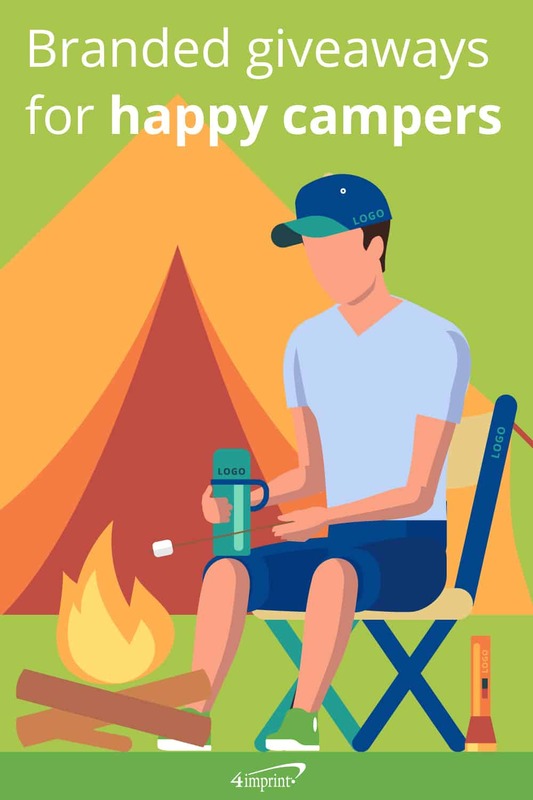 As they head out for a week (or just a weekend) of fun in the great outdoors, these camping promotional items are sure to make happy campers out of your customers and employees. Outdoor activities are on the rise! Your customers and employees will bring these premium outdoor promotional items with them on every outdoor activity. Summer brings beautiful days and nights to spend outside. 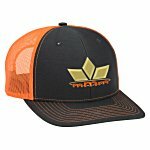 Check out these high-end outdoor giveaways to have them thinking about your brand all season long.